a few days of knee-high mud! along with architects, carpenters and safety coordinators. This week, 182 cubic metres of concrete is being poured ('slab-on-grade') for the new gym floor. ...and as it will be by the time the new school opens in September 2020. As Project Officer Grant Lachmuth indicates, the work continues! 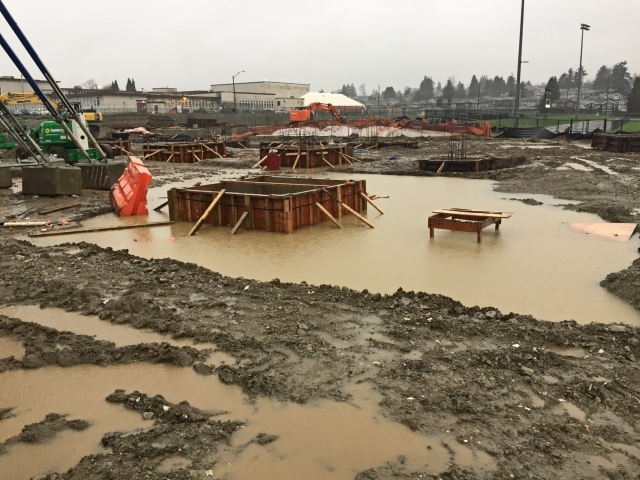 March 20, 2019 – The evidence is in and it’s unmistakable: one of the largest and most up-to-date learning environments in the province is rising up and out of the ground as the replacement for New Westminster Secondary School becomes reality. This week, some 20 truckloads carrying a total of 182 cubic metres of concrete will be delivered to the site. The material is being poured (using a ‘slab-on-grade’ approach) for the school’s huge gym floor – which is the size of three side-by-side gymnasiums. From 7 a.m. to 5 p.m. every week, 50 to 60 trades workers and general labourers, along with a dozen administrators, are on site. They include carpenters, safety coordinators and architects; environmental and geotechnical experts; civil and structural professionals; mechanical, electrical and sustainability experts, and more. 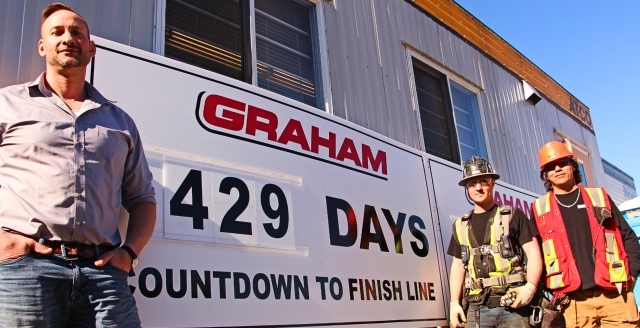 The project’s design-build contractor is Graham Design Builders LP who, with KMBR Architects Planners, was awarded the contract in December 2017 by New Westminster Schools and the Ministry of Education. Sub-trades involved over the life of the project will include another 10 companies, from RDH Building Science to landscape designers Maruyama & Associates and DWD Theatre Design. The district’s Capital Projects Director Dave Crowe has been involved in the New Westminster Secondary School replacement project since the BC government announced funding in June of 2016 – the largest school investment in BC history. Since then, he has heard the aspirations of School Board trustees, parents, students and the community. He’s listened to teachers, staff and department heads about their hopes for the new school’s classrooms requirements. And he’s been involved in the evolution of the design from the beginning. Now when he surveys the massive work site, as he did this week, Crowe can see the three-storey Academic Wing emerging in the east off of Sixth Street. He can conceptualize the huge open space of the Learning Commons – the hub and gathering place for the future school’s 1,900 grade 9 to 12 students. 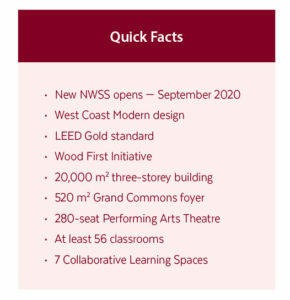 He’s also beginning to make out the Performing Arts Wing to the West, and can envision the 280-seat Performance Centre; the black box theatre for choir, band, dance and concert performances; and, to the north, the emerging gymnasium and athletic wing. 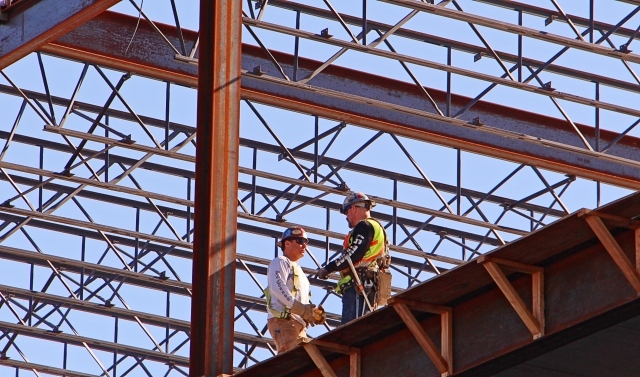 For Chief Project Officer Grant Lachmuth, site activity marks huge achievements in the structural steel construction of the East Wing of the building, with ongoing steel construction now focusing on the North wing. Construction progress at this stage also marks the first installments of ‘hollow-core’ concrete floor panels that demarcate floor levels. And it signifies completion of shear walls that will strengthen the building against lateral forces caused by wind, earthquakes and weight-bearing loads. concrete footings completed throughout the East and North wings of the new school. A project camera situated on the corner of the existing school captures an ongoing bird’s eye view of the overall project as it unfolds. Although winter brought snow, cold weather and mud, making for some unpleasant work conditions, few days were lost – and with the arrival of spring, the project continues on schedule and on budget. One of the major milestones in the multi-year journey is the finalization of the project’s design phase. See related: For more information about the New Westminster Secondary School Replacement Project, visit: newnwss.ca. Graham Design-Builders recently provided its 100% Design Submission outlining all details of the exterior and interior of the building. Their submission has been reviewed by the school district’s Project Team – which includes IBI Architectural Group along with various engineering disciplines. No further revisions or changes are expected at this stage. The next major milestone coming up will be the ‘lockup phase,’ Crowe explains. That’s when walls, doors and the roof will be in place – and work can then shift to the development of the interior of the building. Built in 1949, New Westminster Secondary School is the only secondary school in the City of New Westminster and one of the largest in B.C. Construction is scheduled for completion in the spring of 2020, the new school will open in September 2020. From left to right: For Superintendent Robert Skierka, Carpenter Johnny Beaupré, and Safety Coordinator Trevor Roberts, it’s a massive team effort in getting BC’s largest high school up and out of the ground – on time and on budget.